The Dutch Interactive Awards are the leading digital awards for the best interactive work in the Netherlands. 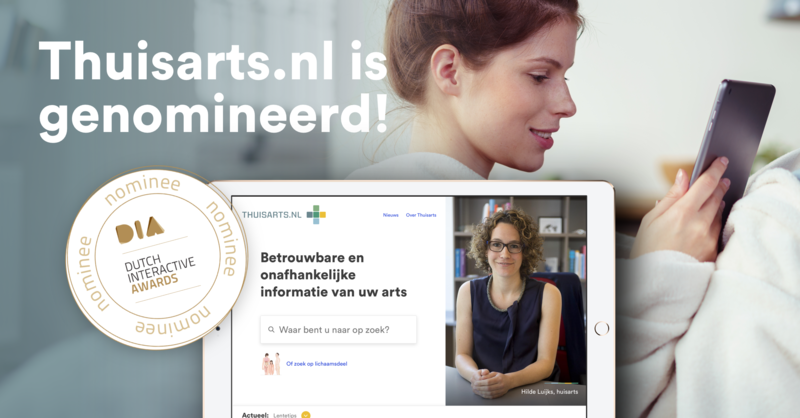 Medical information platform Thuisarts.nl (GP at Home) is nominated for the Dutch Interactive Awards, the prizes for the best interactive work in the Netherlands! Every month more than 1.7 million people find information about complaints and illnesses at Thuisarts. On Thursday, May 31 we will hear whether Thuisarts will be chosen as the best project in the category Content: content driven concepts and / or platforms. How often do you google on medical complaints or symptoms? And how do you know if that information about abdominal cramps or headaches is correct? Information about health and complaints found online is often of inconsistent quality. One Shoe and NHG launched the completely new Thuisarts.nl in 2017 with the aim of bundling scientifically validated medical information and making it even more accessible to the general public. By means of text, self-tests, pictures, illustrations and explanatory films, more than 1200 syndromes can now be consulted, made understandable for everyone: whether you are highly educated or low educated, whether you have a physical or visual disability; whether you are a patient or a general practitioner. The Dutch Interactive Awards are the leading digital awards for the best interactive work in the Netherlands. The jury of the Dutch Interactive Awards evaluates the submitted work on concept, design and UX, construction, result, interactivity and optimization. On Thursday 31 May 2018 there will be announced which agencies have delivered the best work of last year during the vibrant award-show for the interactive industry.